Don Harney, age 95, of Aurora, passed away on Tuesday, January 10, 2017 in Aurora, Nebraska. A Memorial Service will be held 11:00 A.M., Tuesday, January 17th at the Aurora Evangelical Covenant Church. Rev. Karl Larson will officiate. Inurnment will be at Aurora Cemetery at a later date. In lieu of flowers memorials may be made to Aurora Evangelical Covenant Church. Higby-McQuiston Mortuary is in charge of arrangements. Condolences may be e-mailed to the family through the mortuary website at www.higbymortuary.com. 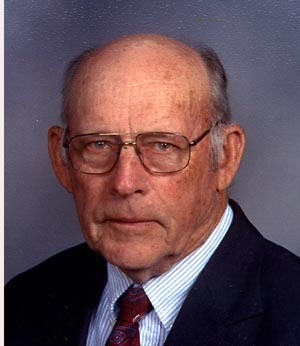 O. Donald Harney, the son of Oscar and Julia (Sandberg) Harney, was born in Marquette, Nebraska on December 26, 1921 and passed away in Aurora, Nebraska on January 10, 2017, at the age of 95. Don graduated from Phillips High School in 1940. On June 23, 1956, Don was united in marriage to Mary Jane Siems at Denver, Colorado. All of their active years were spent farming and raising four children. Through the years, Don had a strong love of God and His Savior. He kept his children and their families constantly in his prayers. Don helped to build Covenant Cedars Bible Camp and was many years on the camp board. He also served on the board of the Aurora Evangelical Covenant Church. Don loved all that had to do with farming the land. He enjoyed nurturing and watching things grow: his children, the trees he planted, the crops he grew, and his cattle and other animals. He especially enjoyed entertaining friends at home, coffee times with the guys, and travel with the family. He was preceded in death by his parents and sister, Doris Ehn. Those left to cherish his memory are his wife, Mary Jane of Aurora; two sons, Daryl (Lesley) Harney of Grand Island and Thomas (Randi) Harney of Lincoln; two daughters, Diane (Bruce) King of Council Bluffs, Iowa and Danielle Harney (Fouad Shar) of Madison, Alabama; granddaughter, Dr. Jennifer Harney and husband Clayton Dirkschnieder of Bellevue; great-grandchildren, Jayonna, Bryson, and Brynleigh Harney and Farrah Shar; sister, Lucille Pipher of Scottsdale, Arizona; nephew, Donald (Nancy) Pipher of Scottsdale; niece, Linda (Lee) Thorsell of Bend, Oregon and other relatives and friends.